If you’ve checked out our maps recently you know that we have covered a lot of ground in Japan, but only scattered readings around the rest of the world. We think these global measurements are really important both to provide some context for the readings we’re taking in Japan and to build a baseline so if something changes in the future there is data to compare against. If we had the data in Japan that we have right now, but for anytime before 3/11 we would know so much more about what actually happened. Getting a global baseline can help should something happen in the future. The main way they are taking these measurements is with a device designed at The Tokyo Hackerspace called a “bGeigie” – it’s basically a geiger counter paired with an arduino and a GPS module which gets strapped to a car and driven around. 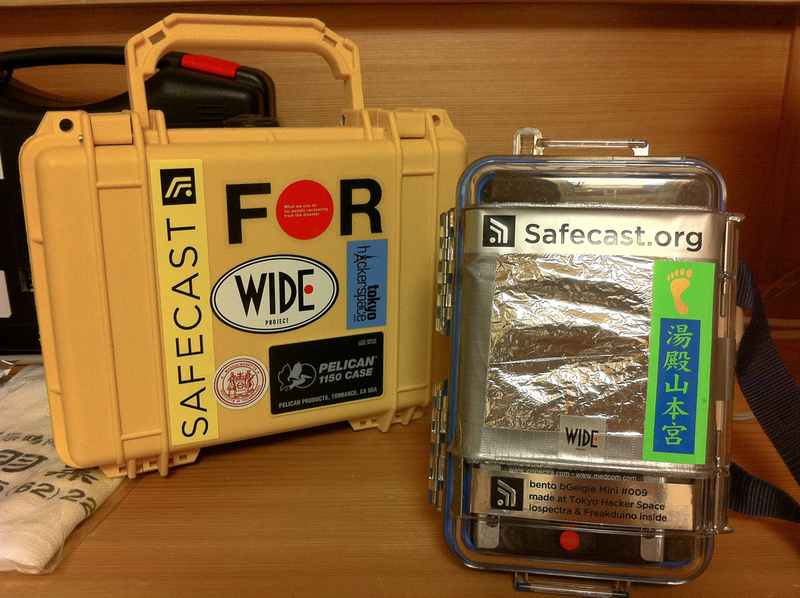 Until now only Safecast team members have been trusted to drive around with bGeigies to collect data. They are kind of finicky, need occasional repairs, kinda pricy and honestly we couldn’t spare any for efforts outside of Japan (bGeigies, not Safecast team members). But now we’re looking to hackerspaces to help us cover more ground. Starting with the US (if this experiment works we’ll add the rest of the world soon) we have the idea of doing a bGeigie Hackerspace tour. The plan is, one bGeigie will make it’s way around the US, from hackerspace to hackerspace, measuring and mapping all the way. For a hackerspace to participate, the agreement would be to drive the device around your city taking a ton of readings, uploading the data to Safecast, and then physically driving (taking readings along the way) the bGeigie to the next closest participant. Ideally this will start and end in Los Angeles at Crash Space, so with any luck the route will be a big giant loop. Depending on who volunteers. Want to get in on the action? AWESOME! Please fill out this interest form and we’ll start planning the route right away.